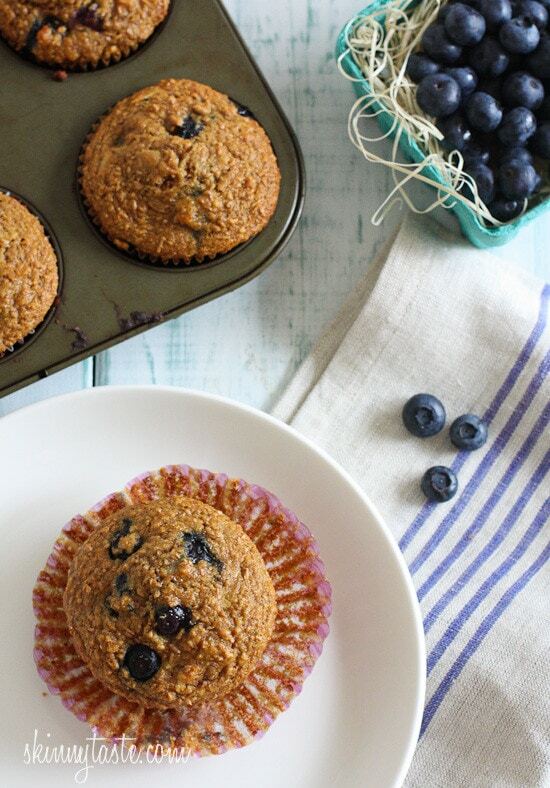 Start your morning right with these healthy bran muffins lightly sweetened with honey, fresh blueberries and coconut flakes. So moist and delicious, you won’t even realize they are light. Someone recently shared this bran muffin recipe with me and I am glad she did. It’s been years since I had a bran muffin, but my first time actually making them and I was surprised how good they turned out. Enjoy one for breakfast with a cup of coffee or tea and you are good to go. Freeze the rest to enjoy throughout the month or make a half batch. Preheat oven to 400°F. Line a muffin tin with 16 liners. Combine the wheat bran, wheat flour, baking soda and baking powder. Stir in nuts and coconut. In a separate bowl, blend applesauce, almond milk, honey, coconut oil, vanilla and egg. Add to dry ingredients and stir just until moistened. Fold in blueberries. Spoon into paper-lined muffin cups and bake for 18-20 minutes, or until a toothpick inserted comes out clean. Gina, your recipes are my absolute favorite! I have all your cookbooks and I’m constantly referring my friends to your recipes. I love ALL of them!!! Thank you! These are super tasty! You won’t regret having them around for a quick breakfast. I made according to the recipe and I’ll put extras in freezer to heat up other mornings. I did have the sticking issues (muffins really stick to paper). I tried spraying the liners with coconut oil but didn’t seem to help. I was going to try to bake without liners but was worried that they’d just get stuck in there instead? I have to tell you that I recently started WW again and had some issues where I needed fiber – lol – so I thought I would try these. These muffins not only hit the spot, they are delicious! It makes me feel like I am eating a wonderful homemade treat instead of following a diet. Thank you so much, for this and for your awesome site. I make these every other week and eat at least one a day. Only add flax seed which does not change taste or texture and just a dash ifCinnamon. Wonderful! I have made these 3 times, frozen them and absolutely love them! 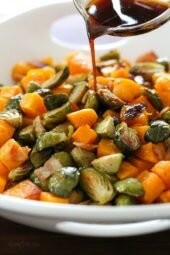 Hi – love your site, and just ordered the cookbook! Could you make these with frozen blueberries? I tried these with mini chocolate chips instead of blueberries. They were good and filled me up more. But I think I like the blueberry better plus you get some fruit in. If I'm using a mini muffin tin, how long would I have to bake it for? I made there for breakfast today. They were so good. At first I thought it was way too much blueberry but I'm happy I followed the recipe. They were great. Loved the flavor and texture. It didn't taste like a healthy muffin to me. It felt like a treat. Gina, I can't find wheat bran anywhere. Can you please share where you purchase it – or possible substitutes? Thank you so much!! I’ve had an impossible time finding bran in the stores near me too. I finally bought it on Amazon—Bob’s Red Mill “wheat bran” along with a silicone muffin pan. They turned out amazing! My bran muffin dreams have finally been fulfilled haha! I’ve been craving these so long and can’t find either a bran muffin, a bran muffin mix, or bran anywhere. Gina’s recipe is fantastic. I omitted the blueberries (personal preference) and used sliced almonds instead of pecans. I sprayed the silicone pan with non-stick spray and the muffins just slipped right out. Thank you Gina! can i use bran buds cereal, i am having difficulty finding wheat bran? Absolutely LOVE making these muffins. I always double the recipe and store them in the fridge for an easy, healthy breakfast. I toast them in the toaster oven and put a light smear of cream cheese…delish! Even my picky husband likes them. I made these (according to recipe) and as always turned out amazing!! My one year old shovels them in and when she sees me grabbing it she goes "mmmmmmm!" She is also a fan of the baked blueberry and banana oatmeal, but it's a mess so we tried these. Delicious! Does anyone monitor this blog for feedback or responses? Sorry, yes but it may take a few days. Perhaps they didn't work since you changed the recipe and took out the eggs. I test all the recipes until they re perfect, so any changes to them can't be guaranteed. I love this. Come on people, if you CHANGE the recipe, you can't complain when it doesn't work… gah. Made these last night hoping they'd be good for my mom. I used the canola instead of coconut oil, and substituted 2 tbls flax seed and 6 tbls water for the eggs. I also left out the walnuts and used maybe 8 ounces of berries. The muffins domed really nice, but when I went to peel the paper away, the entire bottom of the muffin came with it. I reheated the oven and put them in for an additional 9 minutes, and the bottom half of the muffins are still VERY wet. Any suggestions? Once I let the muffins cool completely I had no trouble with them sitcking. I also added a dash of cinnamon and nutmeg which was lovely. I think you could halve the applesauce and use banana – but haven't tried it. Also, think any berries would be yum. I will be making these again – they were DELISH. Very nice recipe and I love the color of your muffin! I will surely try this tomorrow. Will prefer to use coconut oil rather than canola. Hi Gina! Could you substitute the blueberries for raspberries? My boyfriend despises blueberries (he's weird!). Hi Gina! LOVE LOVE LOVE your site!!!! 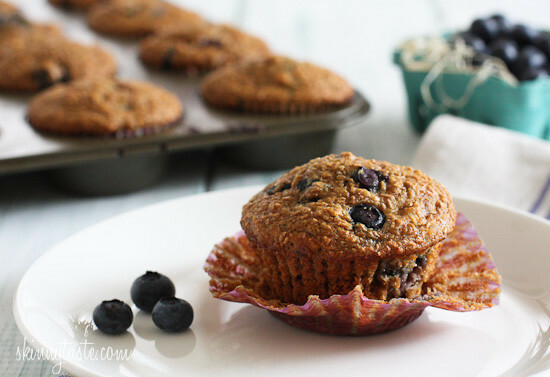 I've been craving banana bran muffins- do you think it'd be possible to add banana to this recipe? If so, should I adjust any of the other ingredients? Thanks for being awesome!! Where can I find wheat bran? I made these tonight and very tastey! I really recommend baking these to anyone who is on the fence. My husband of course didn't like them because they weren't full of sugar, but more for me. 🙂 However, I am having a heck of time with my muffins sticking to the paper wrappers. I didn't spray this batch because I didn't read to (I could have missed it). Interesting note though, I had to use 4 silicon reusable muffin cups because I ran out of pans and sprayed those and they didn't stick! This looks great and cant wait to make these! Iwill try oat bran in place of the flour. Do you think this would be good? Thanks!! I tried it with bran flakes cereal and they were great! A friend of mine makes her bran muffins with bran flakes/cereal. Do you think this would work for these? I bought some cereal because I was going to try her recipe, but it has a TON of fat and sugar in it. Made these last night- the family really liked them (although they said they could tell that they were healthy by the taste of the wheat flour!! )- now I'm trying them out on my co-workers this morning. I substituted oat bran and skim milk, but otherwise followed the recipe exactly…thanks! Can we use unprocessed bran. Not sure what the wheat bran is? Gina I was wondering what wheat bran is? Is it like wheat germ can we use that instead. Someone else asked about regular whole wheat flour? I used wheat germ instead of bran (because of availability) and they turned out scrumptious! My next attempt will be strawberries instead of blueberries. Update: I brought these to work today and everybody is very impressed! The intern said he loves me and my boss says I should sell them. Thanks for always making me look good, Gina! How about using whole wheat flour instead of white? Will that work the same? Wondering if it would still be tasty with unsweetened coconut, as I have some of that on hand that needs to be used! Maybe with a bit of extra sweetener to make up the difference? Should I refrigerate leftover muffins? I make almost these exact muffins but I add a few tablespoons fresh squeezed orange juice and a whole orange rind grated into it! Sooo yummy! What would the calories be if you took out the nuts? I made these last night, as we had blueberries on hand that needed to be used. I was surprised at how full my muffin cups were, this recipe filled all 16 to the brim, and they rose as well. Had one and a half for breakfast this morning. Such a nice alternative to my boring cereal or oatmeal. Next time, will take the spice additions from Stephanie above. Thanks for another great recipe, Gina. Love your blog! I wonder if it would work with gluten free flour. Thoughts? Looks delicious and can't wait to try. Love your blog! 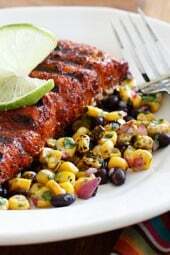 These sound moist and definitely flavorful. I adapted one of your muffin recipes a few months ago and can whole-heartedly say that it is my go-to recipe any time my family wants muffins! Oh yummy! What a great healthy breakfast!! I like that you didn't add sugar, except for honey. I love it!!! Alternating the eggs with flax seed or soy flour, I will definitely bake those beauties ASAP! Oh dear these look devine. I simply must make a batch of these to enjoy this week for breakfast. These ingredients will definitely be on my grocery list for tomorrow. 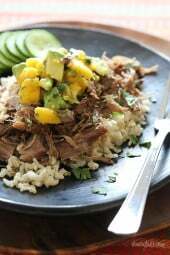 I was also wondering about substituting the coconut for something else or just omitting it all together?! Was just wondering what I could substitue for the coconut and the nuts…as we don't eat either of those…..chocolate chips and….??? Sure, use whatever you like. Yummy! Will also try doing this at home. Thanks for always sharing healthy recipes. Would it be possible to give the alternative for your baking recipes for those of us who don't eat eggs? I'm not sure how much applesauce, for example, would suffice in replacing the two eggs. Any ideas? Thanks! I've heard you can use ground flax seeds with water to replace eggs. You may want to google it to get the exact amount. This looks delicious! I am always looking for new and quick breakfast ideas to try during the work week. This seems like a good one! Thanks for sharing! This looks amazing. Do you know what modifications I would need to make to use Coconut Flour? Gluten intolerance. Perhaps I would use a gluten-free baking blend, I heard Williams Sonoma sells a good mix. These sound and look delicious! I love that you used honey instead of sugar. I hate giving my kids refined sugar so, these would be perfect. I will definitely be giving these a try sometime! One of my favorite breakfast recipes 🙂 So glad you shared this! For any readers who like a bit more spice I usually add cinnamon (1 tsp), nutmeg (1/4 tsp) & cloves (1/4 tsp). Enjoy!! Keep these amazing ideas coming! I love a healthy sweet like this! This looks and sounds delicious! Love the photos you take. We just made the jump from point and shoot to DSLR, Canon Rebel T3 to be exact. Keep up the good work. planning to make these tonight, substituting oat bran for the wheat bran. think that will be okay? Not sure, I'm guess yes but let me know how they turn out. Did the oat bran work out? The oat bran worked out fine! also wanted to add that it made 20 regular muffins and 22 mini muffins. i was afraid to fill the tins too high, but it's a perfect size really and my kids love the mini muffins. thanks again Gina! I was searching for a bran muffin recipe and this looks perfect! Honey heated becomes toxic. Maybe it would be better with other sweetner like agave or maple syrup. I tried to find information on honey and toxicity when heated. It seems even the Honey board recommends recipes where the honey would be baked or heated. There’s no evidence that heat-treated honey is actually toxic. These recommendations come from Ayurvedic medical practices, some of which are based on 5000 yr old beliefs. After all, wouldn't a hot cup of tea with honey then be toxic? These look delicious. 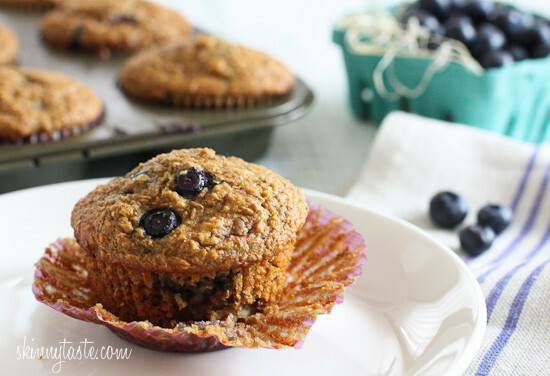 I always love blueberry muffins but it is fun to jazz up the original every now and then. Love the coconut addition! These sound perfect for breakfast before a run- super healthy! Love blueberries and bran together!